Titus Lucretius Carus (/ˈtaɪtəs lʊˈkriːʃəs/; c. 99 BC – c. 55 BC) was a Roman poet and philosopher. His only known work is the epic philosophical poem De rerum natura about the tenets and philosophy of Epicureanism, and which is usually translated into English as On the Nature of Things. Lucretius has been credited with originating the concept of the three-age system which was formalised from 1834 by C. J. Thomsen. De rerum natura was a considerable influence on the Augustan poets, particularly Virgil (in his Aeneid and Georgics, and to a lesser extent on the Eclogues) and Horace. The work virtually disappeared during the Middle Ages but was rediscovered in 1417 in a monastery in Germany by Poggio Bracciolini, and it played an important role both in the development of atomism (Lucretius was an important influence on Pierre Gassendi) and the efforts of various figures of the Enlightenment era to construct a new Christian humanism. Virtually nothing is known about the life of Lucretius. He was probably a member of the aristocratic gens Lucretia, and his work shows an intimate knowledge of the luxurious lifestyle in Rome. Lucretius' love of the countryside invites speculation that he inhabited family-owned rural estates, as did many wealthy Roman families, and he certainly was expensively educated with a mastery of Latin, Greek, literature, and philosophy. Jerome tells how he was driven mad by a love potion and wrote his poetry between fits of insanity, eventually committing suicide in middle age; but modern scholarship suggests this account was probably an invention. In a letter by Cicero to his brother Quintus in February 54 BC, Cicero said : "The poems of Lucretius are as you write: they exhibit many flashes of genius, and yet show great mastership." By this time, both Cicero and his brother had read De rerum natura, and so might have many other Romans. A literary evaluation of Lucretius's work, however, reveals some repetition and a sudden end to Book 6 during a description of the plague at Athens. The poem appears to have been published without a final revision, possibly due to its author's death. If this is true, Lucretius must have been dead by 54 BC. There is insufficient basis for a confident assertion of the date of Lucretius's birth or death in other sources. Another yet briefer note is found in the Chronicon of Donatus's pupil, Jerome. Writing four centuries after Lucretius's death, he enters under the 171st Olympiad the following line: "Titus Lucretius the poet is born. Later he was driven mad by a love potion, and when, during the intervals of his insanity, he had written a number of books, which were later emended by Cicero, he killed himself by his own hand in the 44th year of his life." The claim that he was driven mad by a love potion, although defended by such scholars as Reale and Catan, often is dismissed as the result of historical confusion, or anti-Epicurean slander. In some accounts the administration of the toxic aphrodisiac is attributed to his wife Lucilia. Jerome's image of Lucretius as a lovesick, mad poet continued to have significant influence on modern scholarship until quite recently, although it now is accepted that such a report is inaccurate. Similarly, the statement that Cicero emended (Latin: emendavit) the work prior to publication is doubtful. The exact date of his birth varies by manuscript; in most it is recorded under 94 BC, but in others under 93 or 96. Lucretius (a materialist writer) and Jerome (a Christian priest) wrote for opposing purposes, and whether or not Jerome attempted to disparage Lucretius's work as the work of a madman is an open question. Within this work, Lucretius makes reference to the cultural and technological development of man in his use of available materials, tools and weapons through prehistory to Lucretius' own time. He specifies the earliest weapons as hands, nails and teeth. These were followed by stones, branches and, once man could kindle and control it, fire. He then refers to "tough iron" and copper in that order but goes on to say that copper (sic) was the primary means of tilling the soil and the basis of weaponry until, "by slow degrees", the iron sword became predominant (it still was in his day) and "the bronze sickle fell into disrepute" as iron ploughs were introduced. He had earlier envisaged a pre-technological, pre-literary kind of man whose life was lived "in the fashion of wild beasts roaming at large". From this beginning, he theorised, there followed the development in turn of crude huts, use and kindling of fire, clothing, language, family and city-states. He believed that smelting of metal, and perhaps too the firing of pottery, was discovered by accident: for example, the result of a forest fire. He does specify, however, that the use of copper (sic) followed the use of stones and branches and preceded the use of iron. Lucretius seems to equate copper with bronze, an alloy of copper and tin that has much greater resilience than copper; both copper and bronze were superseded by iron during his millennium (1000BC to 1BC). He may have considered bronze to be a stronger variety of copper and not necessarily a wholly individual material. 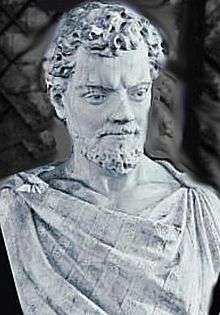 Lucretius is believed to be the first to put forward a theory of the successive usages of first wood and stone, then copper and bronze, and finally iron. Although his theory lay dormant for many centuries, it was revived in the nineteenth century and he has been credited with originating the concept of the three-age system which was formalised from 1834 by C. J. Thomsen. 1 2 Melville (2008), p. xii. 1 2 Melville (2008), Foreword. 1 2 Jerome & 380 AD, 1920. 1 2 Greenblatt (2009), pp. 53–54. ↑ Cicero & 54 BC, 2.9. ↑ Virgil & c. 31 BC, 2.490. ↑ Lucretius. De rerum natura, Book V, around Line 1200 ff. 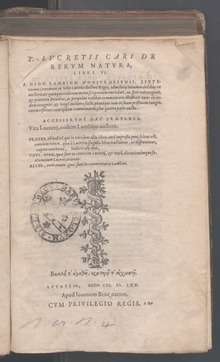 1 2 Lucretius. De rerum natura, Book V, around Line 940 ff. Jerome, Saint. "Chronicle". Retrieved 16 May 2012. "Lucretius". Encyclopædia Britannica. 17 (11th ed.). 1911.